1.Preheat oven to 400°. 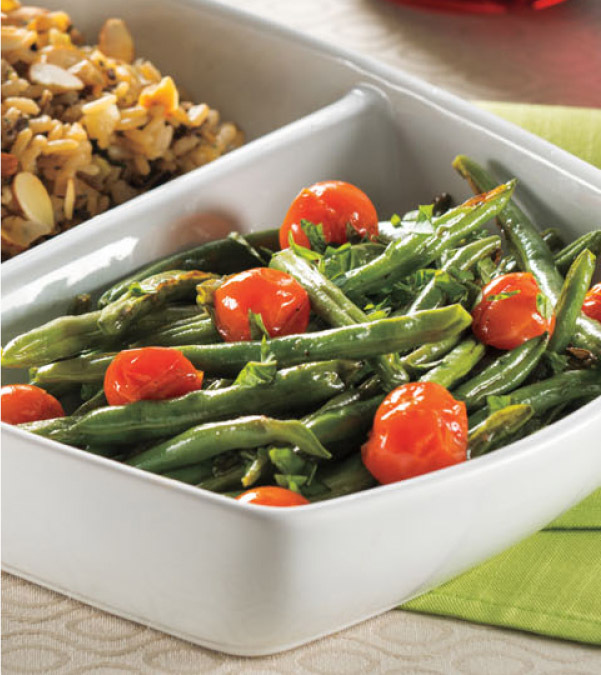 On large rimmed baking pan, evenly spread green beans; on second large rimmed baking pan, evenly spread tomatoes. Drizzle each with 2 tablespoons oil, 1/2 teaspoon salt and 1/2 teaspoon pepper; toss to coat on all sides. 2.Roast 20 minutes or until green beans are tender-crisp and tomatoes begin to char slightly, stirring once halfway through cooking. Transfer beans and tomatoes to large bowl; add basil and toss to combine.